Polar bears range across the circumpolar Arctic, and are uniquely adapted to life on the sea ice environment. In fact they rely on the sea ice for hunting, migration and reproduction. Due to feedback patterns in the atmosphere and sea ice, climate change is warming the Arctic twice as fast as the rest of the planet. As a result, sea ice is rapidly disappearing, with a 40% decline in summer sea ice since satellite measurements began in 1979. Sea ice loss has been correlated with declines in body condition, reproductive success, and survival of polar bears. 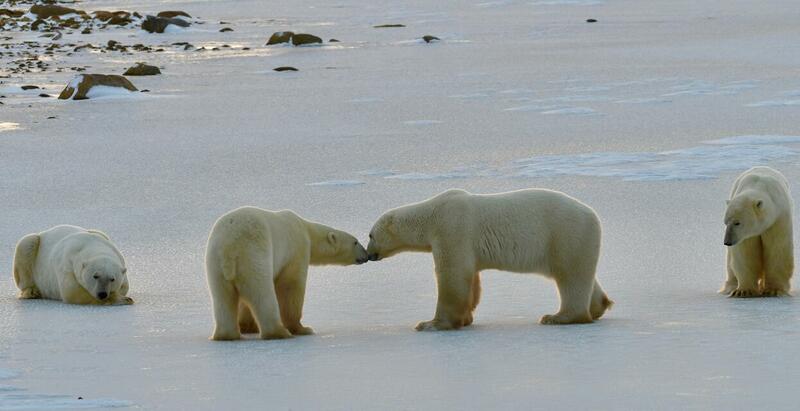 Studying polar bears requires collaboration and innovation. A single polar bear home range can be up to 500,000 square kilometers in size, and cover some of the most inaccessible areas and extreme environmental conditions our planet has to offer. To work effectively for the conservation of polar bears, our Population Sustainability team collaborates extensively with other non-governmental organizations, government agencies and research institutions. Working together, we can ensure that the crisis unfolding in the Arctic is met with the best science available. Rapidly changing habitat brings many challenges to polar bear survival. To properly assess strategies for the conservation management of the species, the Population Sustainability team is leading research in the field to understand how polar bears are affected by sea ice loss. Field research includes investigating how polar bears use scent to find mates, how changing ice conditions are affecting the prevalence of disease, monitoring maternal behaviour at den sites, as well as measuring sea ice habitat and polar bear movement ecology at a finer scale than previously achievable. SDZG is also committed to minimally invasive approaches to polar bear research, working with outside partners to build ruggedized remote camera systems and unmanned aerial systems that can be deployed in the harsh Arctic ecosystem. The San Diego Zoo’s dedicated animal care team actively collaborates in research with Population Sustainability, allowing SDZG to answer fundamental questions about polar bear physiology. Research includes a comprehensive account of polar bear hearing sensitivity and acoustical communication, validating tracking collar data of wild polar bears to describe activity patterns, measuring energetic output of polar bear movements, as well as verifying measurements related to the health and condition of wild polar bears. The data collected from Zoo-based research improves the interpretation of data collected in the wild, furthering our understanding of polar bears.